The Artist in Residence Program at Recology San Francisco will host an exhibition and reception for current artists-in-residence Beau Buck and Karrie Hovey on Friday, May 18, from 5-9pm and Saturday, May 19, from 1-5pm. This exhibition will be the culmination of four months of work by the artists who have scavenged materials from the dump to make art and promote recycling and reuse. Beau Buck has cited identification with animals as an important component in his art, so it is no wonder that the work of bees producing honey is a metaphor for his creative process while at Recology. He has likened the materials in the dump to a nectar, a raw material waiting to be transformed, and he has indeed performed a bit of alchemy turning disparate fabrics and metals into cohesive artworks. Buck’s work conjures up notions of an earlier era—before answers to everything were available at our fingertips—a time filled with lore and a reverence for the unknown, tinged with romanticism and mysticism. Working with bits of scavenged fabrics, leather cut from boots, antique fur coats, worn denim and tattered Persian rugs, Buck has constructed a grouping of life-sized jackrabbits. Each rabbit takes on a distinct character, and this collection of desert drifters, fading beauties, and wily explorers seems gathered to silently lament an earlier era or the passing of a friend, each imbued with the histories and stories associated with the materials assembled to create it. “Each piece instructs me toward an understanding of what it means to be an artist, and where art belongs in our physical and digital world,” says Buck who moved to San Francisco from Philadelphia two years ago. 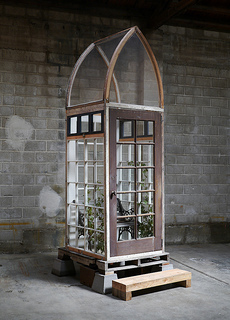 Other work includes a romantic (or potentially claustrophobic), vine-covered structure made from windows and glass-paned doors which houses a small bench, and a series of cast lead feathers. Buck made molds of falcon feathers given to him by Recology’s falconer, Indigo, who uses birds of prey to scare away seagulls at the facility, then melted fishing weights and small pieces of pipe to cast leaden versions. The resulting silvery feathers take on atalisman-like quality as they are exhibited strung together, hanging in groups, like herbs drying to be used in an unknown ceremony. Buck holds a BFA from the Rhode Island School of Design and has exhibited on the East Coast and in California. During her residency at Recology, Karrie Hovey has made work that addresses the compulsion of humans to alter or manipulate the landscape, while also exploring her own interest in multiples and variations within multiple forms. From the deliberate clearcutting of forests and building of sprawling residential developments to the inadvertent melting of the polar icecap and creation of oceans of plastic resulting from our lifestyles and consumption practices, Hovey’s work alludes to this human urge to modify and meddle and its profound long-term impact on our natural environment. Working with the term groundcover, she has created art pieces that do indeed cover the ground—in this case the floor of the studio—and which suggest landscapes viewed from the air. Hovey has used the glass kiln in the art studio to melt a variety of scavenged, broken glass and has produced forms in glistening, arctic-like colors which have the appearance of melting ice. Like glass, another material in abundance at the facility is atex paint, and Hovey has poured it on flat surfaces, then once it has dried, has peeled it up and sliced it up into shapes and strips. lShe has woven the resulting new material creating grid-like forms that appear like pixels from our Google-mapped, manipulated landscapes. 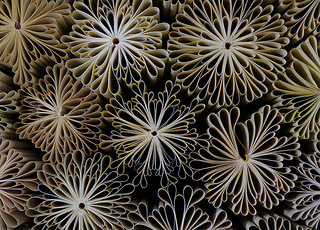 Working with discarded books, she has constructed a field of repeating chrysanthemum forms, and like the flowers which are sometimes associated with grief, this work can be seen as morning the loss of physical books while also suggesting the forests of trees used in their creation. Hovey received her MFA at San Francisco State University and has complete residencies in locations around the world, including China, Spain, the Netherlands, and France. The Artist in Residence Program at Recology San Francisco is a one-of-a-kind program established in 1990 to encourage the conservation of natural resources and instill a greater appreciation for the environment and art in children and adults. Artists work for four months in studio space on site, use materials recovered from the Public Disposal and Recycling Area, and speak to students and the general public. Over ninety-five professional Bay Area artists have completed residencies. Applications are accepted annually in August. Directions to 503 Tunnel Ave.
Go south on Highway 101 and exit at “Candlestick Park/Tunnel Ave.” After the stop sign, continue straight on Beatty Rd. Turn right on Tunnel Ave.
Go north on Highway 101 and exit at the first “Candlestick Park” off-ramp. Stay in the left lane and take the first left toward the stop sign. Turn left onto Alanna Way and go under the freeway. At the next stop sign, turn right on Beatty Rd. Turn right on Tunnel Ave. The “T” Third St. streetcar and bus lines 8x, 9, 9L, and 56 stop at Bayshore Blvd. and Arleta Ave. (three blocks away). The Caltrain “Bayshore Station” stop is directly across the street from our facility.